People say this a lot to me. "I want to freelance/open my own business/work remotely, but I'm not sure if I should." I can't answer this question. I can tell you what I've learned. I can offer my own story of knowing from the beginning that I wasn't normal. I was a little weird. I'm a good worker, but I think I clashed with traditional workplaces. I had my own ideas for what my career should look like and that didn't involve leaving my pay grade, daily schedule, or vacation time up to someone else. If you want to work for yourself, you need to do a couple things first: Identify your skills and assess your core values. Some people are not disciplined enough to work alone, so they need the structure of an office. Others might like the stability of a traditional job. Asking yourself what you value most might help you decide whether you should jump or not. If you want to jump, figure out what you can offer next. Which of your skills are transferable? I'm a creative person, but I'm also driven. I like to work quietly on my own, but also with teams. I like to have flexibility when life asks for that kind of freedom, but I typically follow a strict routine. 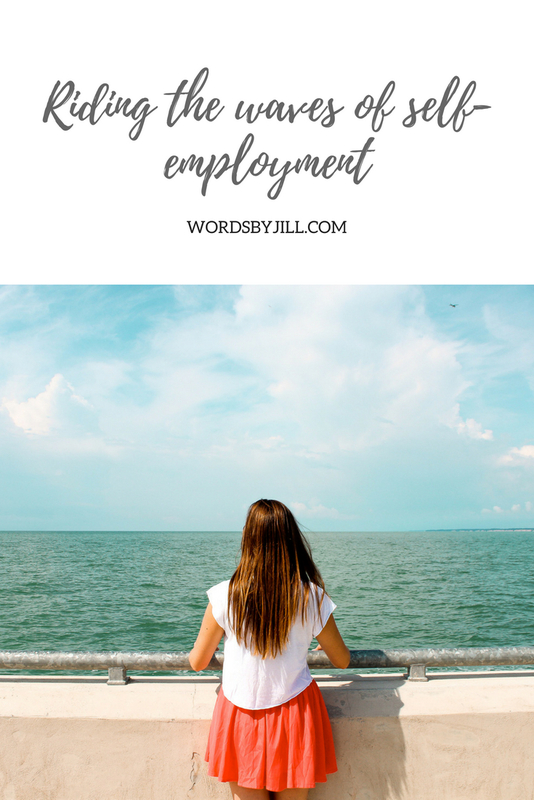 I didn't always knew what I was doing, but I knew that the non-traditional lifestyle of self-employment was probably the way for me. It's funny though because I didn't have much time to think about this. I never had a "real" job. I applied for a couple, but I half-assed those applications. I was offered one, but I turned it down and stopped searching because I realized I wouldn't find my career in someone's office. I found it on my own. I typically follow a routine, but every day is still different. Each day is dedicated to a new topic. A new client. I sort through inquiries and submit final work all in the same week. It's easy to feel overwhelmed. I've learned to prioritize and schedule my time wisely, but also leave space for the unexpected. Some days are high, others low. Every day brings new lessons. The moment I realized that I didn't want to say "Yes" to every inquiry is the moment I started growing as a business. I'm not perfect for everyone and now that I recognize this, I walk away from discovery calls with people and brands and businesses that just aren't the right fit for me. I'm a little picky now, actually. Always save for a rainy day because I know for a fact: When it rains, it pours. Large companies have a cushion to continue paying you even through slumps. When you're self-employed, you need to save that cushion for yourself. There is so much to be thankful for when working for yourself. There is even more to be worried about. And for me, there's so much more I want to do that it's overwhelming sometimes. I try to consciously remind myself of everything I am thankful for multiple times in a day. I love the freedom my lifestyle grants. However, when you're a one-person show, there's no one to call in when you want to spend the day at the beach. But when priorities are taken care of, I don't have to ask anyone to take off. Each high and low holds the possibility of a lesson if you approach life with the eyes of a student. What can you learn from your situation today? I value lifelong learning and am lucky enough that my career grants this. It's hard to not get discouraged when there are so many of us playing this game. Paying with likes and comments and hoping that followers want to see what we are up to. On those discouraging days it's better to take a step back and remember why you do what you do. Do you want to start freelancing? These days I consider myself self-employed or a small business owner because the word "freelance" no longer captures everything that I do. I offer a selection of services to provide a boutique experience for clients. The majority sign extended contracts for my time. When I started, I was a freelancer. I took a lot of jobs to practice, gain new skills, and grow my portfolio. Quite a few people on Instagram said they were interested to learn how to start freelancing. I'm brainstorming ways to offer those interested a longer guide to creating this lifestyle. In the meantime, I'd love to answer any questions you have! Send me an email or leave your questions in the comments below.